Before we get to the hitting let's mention other aspects of the game. The Durham Bulls are a very good defensive team. They have committed the fewest errors on any team in the International League, 43. To put that into perspective, the next best team, Louisville, has committed 61 and the worst, Norfolk, has committed 96. Our catchers have allowed only 52 stolen bases (the worst, Scranton/Wilkes-Barre has allowed 100). Our runners have stolen 100 bases, best in the league. The Bulls runs allowed (clearly mostly the pitching, of course) is the lowest in the league. As a crew they have shown great versatility as well. So far we’ve had 21 different ballplayers on the roster. We’ve had 7 different guys play catcher, 4 at first base, 5 at second base, 5 at shortstop, 4 at third base, and 8 different guys in the outfield. Over in the hitting categories, the Bulls are usually in first or second place, sharing honors mostly with the Cleveland Triple-A team, the Columbus Clippers. Columbus is having a terrific season as well, at 55-36 to our 55-35. Would have been interesting to have been in the same division as them. Glad we weren’t. The Bulls lead the league in runs scored and home runs; we are second to Columbus in team batting average (.277 to .288), team OPS (.794 to .812), and team wOBA (.352 to .367). The Bulls are 2-2 against in our one away series back in May. We meet again this month at home. Now let’s take a look at the roster. Just for comparison, I’ve got the Rays position players as well. An oddity is that we have 12 position players (infielder Omar Luna comes and goes) and we are carrying three catchers. That’s because the Bulls have essentially a 24-man active roster and usually split that 12-12 with the pitchers. 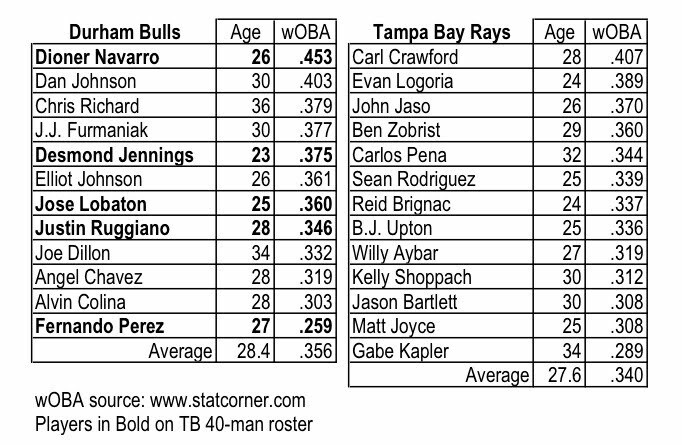 The Rays have a 25-man active roster. 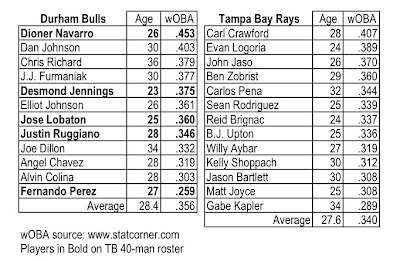 As can be seen, five players on the Rays 40-man roster are with the Bulls. As far as I can tell, the only position player not with the Rays and not with the Bulls is outfielder/first baseman Leslie Anderson. Anderson is currently in Montgomery and we can expect to see him before the end of the year. Without diving into a birth month analysis, the average age of the players on the two team’s rosters is pretty much a wash. The Bulls have the players at the extremes (Jennings, 23, and Richard, 36). As we’ve been noting all year, the Bulls are very much a veteran team. Of course, comparing the wOBA between two very different levels of play is hard to do. Particularly difficult are the differences in the quality of pitching faced. On the other hand, we should note that all Triple-A playing fields are required to be maintained at major league levels. So the differences there (not the ambiance, of course) are not all that much. So, what might happen over the next month or so? Particularly, say, for the players at the top of the list? Dan Johnson is something of a special case. So lets look a the others. First, several of the Bulls' best are not on the 40-man. To go up to the Rays someone would have to be taken off their 40-man and at risk of being lost to the Rays system entirely. Second, with the exception of Elliot Johnson, the non-40 man players are “old”. Third, to be called to the Rays, they have to perceive a need. Fourth, some of these guys could easily be seen as trade bait. And their numbers are likely to make them attractive. Lastly—don’t fall out of your chairs—several may be with the Bulls because the Rays want the Bulls to be the best team in Triple-A baseball. With all that in mind, here are some possibilities in the short run. I can’t make a better case for Dan Johnson going to the Rays than the one made over at DRaysBay recently. But that’s if the Rays really want him. I’m betting that they’ll put him into a trade package. If the day comes that the Rays want to shuffle the 40-man, I’m afraid that Fernando Perez is likely to be the top candidate to be waived. Gotta think that they are also watching Navarro closely and either Navarro or Shoppach is available for a deal. But that’s the Rays. I don’t really care about them. What about the Bulls? Here’s the interesting part. Seems to me that, except for Dan Johnson, there’s a really good chance they will leave us alone for a month or so. Leaving us with a terrific infield, pretty good outfield, and decent power (especially if Ruggiano, Richard, and Elliot Johnson step up as they certainly can and have. As much as I love having Dan with the Bulls, he deserves a shot at the next level. If they don't trade him before the deadline, they should be honorable about it and offer to release him so he can sign with a team that will give him a shot at the majors. I have to think there are a lot of teams that would have him up with the big club now. And, it looks like Elliot Johnson got the winning RBI in the game today.